Product prices and availability are accurate as of 2019-04-19 01:29:17 EDT and are subject to change. Any price and availability information displayed on http://www.amazon.com/ at the time of purchase will apply to the purchase of this product. 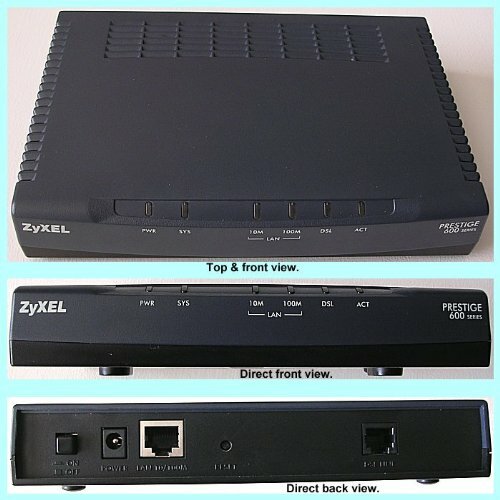 Designed by ZyXEL, it is a ADSL Modem. The Prestige 600 Series. Specifically, it is the 642m-11 model. The power adapter is NOT included. The back contains (see 1st photo bottom) L to R: On/Off button, power, LAN 10/100M, reset, and DSL line. The front contains (see 1st photo middle) L to R: power, SYS, 10M (LAN), 100M (LAN), DSL, and ACT. We put many of the specs above (Item-Specifics) so make sure to check that out too. We do not have any other info on this other than what you read above. Works. The company changed to a different brand and this ZyXEL was no longer needed. This is just the modem. No power supply, software or manuals come with this. Measurements are approximate: 7" x 5" x 1.25"